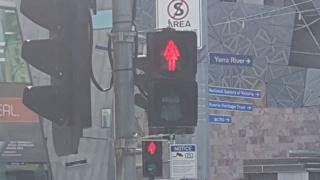 Traffic signals depicting pedestrians in dresses have been unveiled in Australia as part of a gender equality campaign. The trial programme in Melbourne is designed to "reduce unconscious bias", said to the lobby group behind them. But the 10 signals in the city centre have drawn a mixed response, with critics saying they are unnecessary. Organisers hope the city's pedestrian crossings will ultimately depict men and women in equal numbers. "Unconscious bias reinforces stereotypes and influences daily decisions and attitudes," said Martine Letts, CEO of lobby group Committee For Melbourne. The signals would "draw our attention to these issues in a practical and positive way", she said. But not all people approved of the change, which is a 12-month trial backed by the local roads authority. Melbourne Lord Mayor Robert Doyle told the Herald Sun: "I'm all for doing anything we can for gender equity, but really?" "Unfortunately, I think this sort of costly exercise is more likely to bring derision." Criticism was also expressed on social media. Others pointed out possible issues with how genders are represented. Victorian Minister for Women Fiona Richardson said there were "many small - but symbolically significant - ways that women are excluded from public space". "This is a wonderful way to make public space more inclusive for women," she said in a statement. The trial signals were installed on Tuesday ahead of International Women's Day. Organisers said the cost of future rollouts could be minimised by coinciding them with scheduled replacements of old signals. It comes a year after a Melbourne council depicted the city's first female councillor in a pedestrian signal.